How Many Calories in Corned Beef and Cabbage? Tony’s written about green tea on this St. Patrick’s Day. But I’m more partial to the traditional Irish-American dish of corned beef and cabbage today. If you are too, here’s a wee health guide for ye. 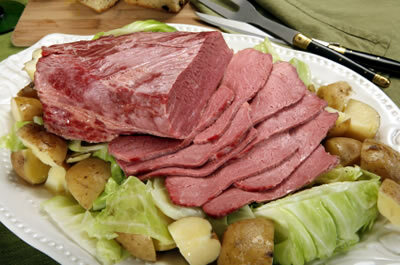 A four-ounce serving of corned beef has 210 calories, according to SparksRecipe.com, add roughly another 70 calories for the accompanying potatoes, plus 14 for the cabbage. All-in-all, not too high a calorie count for a special day. The sodium stands at 819.4 mg a serving, also not bad if you limit yourself to four ounces. Interestingly enough, I looked for a national restaurant chain that might be offering this dish today but couldn’t find one that listed calorie information for it. I also looked at some local Chicago Irish restaurant favorites but they also had no nutritional info on this dish. So, if you eat it away from home, ask about nutritional info and see what kind of reaction you get. They might be thinking you kissed the Blarney Stone before coming to dinner and you might be thinking the same of them.